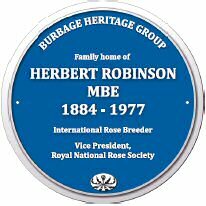 Herbert Robinson was 'regarded as one of the greatest hybridist in horticulture’ when Harry Wheatcroft wrote his book My life with roses’ in 1959. Herbert was then at the peak of his success breeding roses. 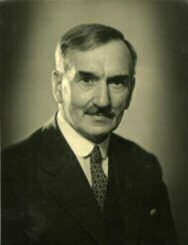 From humble beginnings, born in Burbage in 1884 the eldest son of framework knitter John and Rachel Robinson, Herbert was educated at the Burbage National school under the headship of Charles Higham. The Robinson family lived at 16 The Horsepool before Herbert’s parents and younger siblings moved to 109 Church Street in the early 1900s, where Herbert created a beautiful garden for his parents to enjoy. After leaving school at the age of 13 his early years were spent training in horticulture at various private estates around England. In 1916 he purchased two and a half acres of land and started the Victoria Nurseries breeding delphiniums and pyrethrums obtaining in 1922 his first Royal Horticultural Society Award for the pyrethrum ‘Eileen May’ named after his daughter. Two of Herbert’s children, Harold and Doreen worked in the family business and his son Harold became a talented hybridist in his own right. By the 1930s the nurseries had expanded and moved to Coventry Road where Robinson Way now stands. Concentrating on rose breeding his first RNRS gold medal was awarded in 1933 for Phyllis Gold followed by Christopher Stone in 1934, one of the Burbage bred roses that can be found planted in Pughes Paddock on Grove Road, Burbage. After winning many gold medals from the Royal National Rose Society he became an honorary Vice President in 1950 and for many years a judge at Chelsea and other national shows. Throughout his long life Herbert received many awards including the Queen Mary gold medal, the RNRS Veitch medal, and the MBE in 1956 for his services to Horticulture. Herbert Robinson died aged 92 in April 1977. In all his business successes Herbert maintained a remarkable sense of humour which together with his indigenous pride in Burbage and the people who grew up with him won for him the affection as well as the admiration of all who made his acquaintance. Charles Higham was appointed Headmaster of the Burbage Church School, later the National school on the 31st December 1878. Charles remained in the post until his retirement in March 1920. Having local connections he moved to Leicestershire after marrying Lucy Tredell from Wolstan, Warwickshire. The National School situated next to St Catherine’s Church had opened in 1872, Charles became the third Headmaster with a staff of four and 66 pupils on the roll. As a founder member of the Burbage Constitutional Club and its first secretary he served the village most of his life as a Parish Councillor, church Warden and Superintendent of the Sunday Schools. During the First World War he worked tirelessly to support the men on active service and their dependents and took a leading role in the scheme for the erection of the war memorial. After living on Church St for many years, Charles had Cheadle House built on Britannia Road, the house being named after Highams birthplace Cheadle in Cheshire. They later had a retirement home built on the Hinckley Road, Burbage. From his long association with the village school he has gained the entire confidence and affection of the Burbage people. Some thousands of children passed through his fatherly hands during those 42 years and it is tribute to his careful tuition and wise guidance in after school life many of his old boys and girls now hold important positions throughout the world". 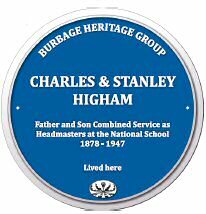 Four of Charles Highams six children became pupil teachers under their fathers headship at the Burbage National School. Stanley was the fourth child and second son born 14 May 1883. In September 1895 Stanley along with John Iliffe obtained a County Council Scholarship of £10 enabling him to attend Hinckley Grammar school. After teacher training college at St Marks Chelsea, London, he returned to Hinckley in 1905 to his first teaching post as assistant master at Hinckley Church of England School. In September 1913 he succeeded his brother in law, Charles Picken as his fathers deputy at Burbage. With the possibility of conscription imminent he married Margaret Baxter, daughter of the proprietor of the Hinckley Times in August 1915 and by December he had enlisted under the Lord Derby Scheme of voluntary Assent to be called up when necessary but those married would be called up last. Keen tennis players the couple were members of the Hinckley Central Tennis Club which was situated behind their home West View on Hill Street. He was the first man from Burbage to play in the Leicestershire County Tennis Team. 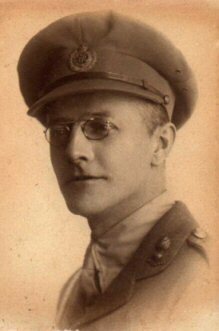 After serving in WW1 he resumed his post at Burbage in 1919 and on his fathers retirement in March 1920 Stanley succeeded his father as head of the National School. With over 200 pupils it was decided a new school should to be built on Grove Road and amalgamated with the Wesleyan School. Stan became the first head when it opened in 1927. The first Burbage representative on the Hinckley Urban Council he received a record number of votes, a record which stood for many years. An educationalist with modern views he worked on many committees referring to Education and Health. He fought for the immunisation against diphtheria which was eventually adopted nationally. In November 1946 Stanley retired early due to ill health ending the Higham family service to education in Burbage. At his Funeral in September 1947, pupils past and present lined the pathways up to St Catherine’s Church. "He was never ashamed of people knowing who he was or what he stood for. He could not do too much whether it was for the church or the village; he was much loved as we always knew what he was and what he stood for." Higham Way, Burbage was named in tribute to this teaching family. Edward Crump studied Civil Engineering under Sir Fredrick Cook at Nuneaton. Cook later became Minister of Transport in 1942 and designed the first motorway system in the UK. Born in Cheltenham, Edward moved to the area with his wife Olene', and son Tom, living for many years on Mount Road, Hinckley. Following his appointment as Chief Borough Engineer for Hinckley in February 1903, he was responsible for the design and specification of many buildings and schemes in the area, the most important one that was of benefit to Burbage was the Burbage Water Scheme of 1915. For over forty years the question of a public supply had been discussed and dismissed on the grounds of expense although on completion the scheme came in under budget at £3,700. Burbage had the unenviable reputation of being one of the most insanitary parishes in the district with four outbreaks of Cholera in the 1800's. The new supply was turned on by Charles Hands at a valve near the St Catherine's Church on 30 July 1915 ensuring the inhabitants of the village would have an uncontaminated water supply. Edward gained valuable experience working on the Hinckley Water Scheme publishing papers in 1912. A talented amateur operatic performer, often in Comedy roles, he was a founder member of the 1908 Hinckley Choral Society and performed with the Hinckley Musical and Dramatic Society mainly in Gilbert and Sullivan productions prior to World War 1. Edward enlisted with the Royal Engineers and had a distinguished career in WW1. Rising to the rank of Lieutenant Colonel he was four times mentioned in dispatches and was decorated by George V with the OBE and the Portuguese awarded him the ancient order of Aviz. After the war he returned to his former position in Hinckley until 1919 when he took up a post with the Ministry of Health in Bristol. After six years in the post Edward returned to Hinckley, and set up in business as an architect and surveyor planning many local public schemes including the George Ballroom. On his return to the area, the family, which now included a daughter Phyllis, moved to Tong Lodge in Burbage. 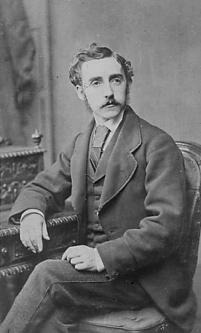 Edward resumed some of his old interests and performed in Handel’s Messiah at the Regent Theatre in the revived Hinckley Choral Society in 1940. A keen sportsman he was secretary of the Hinckley Cricket Club and member of the Burbage Constitutional Club. 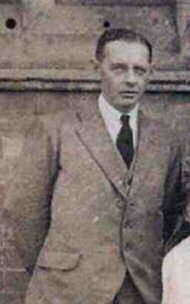 His son Captain (Edward) Tom Crump who had held an appointment with the Rural District Council was killed whilst serving with a bomb disposal unit in London in January 1941. He left a wife Elizabeth and a daughter Phoebe, the Crump's only grandchild was born in May 1941. His wife returned to her home at Dunton Basset and later remarried but the family remained in close contact. Captain E T Crump's name was placed on the Burbage War Memorial opposite his old home of Tong Lodge and also on the Dunton Basset War Memorial. Edward continued to work as an architect into the early 1950s when he specialised in domestic architecture designing many houses in Burbage. He developed poor eyesight and his wife Olene' worked as his assistant doing much of the shading and colouring on his architectural plans. After her mother Olene', who was born in Shanghai in China, died in 1955, Phylis married Charles Abbot and lived until the 1960's at Archer Cottage in Burbage. Edward Crump died on 1st September 1956. In his obituary he was described as a friendly man who was always ready to make conversation with new acquaintances and tell them about Hinckley. He seldom talked about his distinguished military and professional career although he was recognised as one of the most capable men in his profession who contributed greatly to the health and well being of Burbage. The mathematician renowned for his work with Sir Isaac Newton. He invented many mathematical formulae including logarithmic spiral, least squares and the Newton – Cote’s formulas. Born at Burbage rectory on July 10 1682, the second son of Robert Cotes, Rector of Burbage and Grace nee Farmer of Barwell. Roger had an elder brother Anthony, born 1681 and younger sister, Susannah born 1683. The site of the Burbage Rectory, Rogers birthplace is unclear. It may have been near the present Rectory on New Road or it could have been where the Constitutional Club now stands on Church Street. Cotes father left property here, the rents of which should be used in the various bequests of the Cotes charity. At first Roger attended school in Leicester. His mathematical talent was recognised at an early age by his Uncle John Smith (who married his maternal aunt Hannah) and took on the role of tutor to encourage Rogers’s talent. 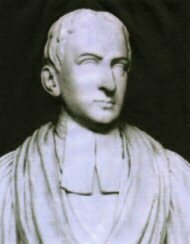 The Smiths son Robert was a close associate of Roger throughout his life and it was he who commissioned the bust sculptured posthumously by Sheemakers in 1758 which can be seen in Trinity College Cambridge. Cotes later studied at St Paul's School London and entered Trinity Cambridge in 1699. He graduated with a BA in 1702 and MA in 1706. At the age of 26 he became the first Plumian Professor of astronomy and experimental astronomy collaborating with Newton on his famous work Principia which explained Newton’s theory of universal gravitation and writing the preface of the second edition. In 1709 – 1713 Cotes worked with Newton on a more detailed edition of his famous work Principia and he inspired Newton to do more research on the laws of gravity. Cotes died suddenly of a violent fever at Cambridge in 1716 at the early age of 33. Isaac Newton’s tribute, ‘If he had lived we would have known something’. 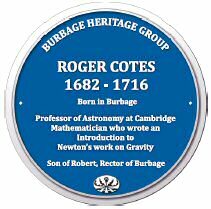 Roger Cotes memorial can be seen at Trinity Cambridge and his father's grave is in St Catherine’s Churchyard, Burbage. 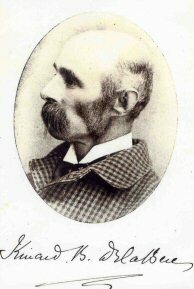 Kinard Baghot de la Bere moved to the area from Wales after purchasing Burbage Hall in 1881. Born Kinard Edwards in Prestbury, Gloucestershire, the third son of the Rector John Edwards and wife Elizabeth. The family had adopted the Baghot de la Bere name probably in the 1830's. Kinard's maternal Grandmother Jane de la Bere was a joint heiress of the Baghot de la Bere estates at Southam, Gloucestershire which had passed to the female side so the name had been lost. The Baghot de la Bere family were patrons of St Marys Church, Prestbury for many centuries and it was here in 1825 that Kinard's father John Edwards became vicar. As head of the family John de la Bere was allowed by the college of arms to adopt the Baghot de la Bere surname and use a modified version of the de la Bere coat of arms which can be seen at the top of the east window in St Catherine’s Church, Burbage. Trade Directories for Burbage after 1899 state the window was given by Baghot de la Bere, probably in memory of a son, but there is no documentation to support this. Kinard's early childhood was spent at the Rectory on Deep Street, Prestbury, a fine Cotswold stone house in large grounds dating back to Queen Anne’s reign. By the age of 11 Kinard was one of the early pupils at Marlborough College. Marlborough College was established in 1843 by a group of Church of England clergymen, with the backing of the Archbishop of Canterbury for the primary purpose of educating the sons of clergymen. By 1848 there were 500 pupils, a third of the students sons of Clergymen with fees 30 guineas a year. Subsidised by the non-clergy pupils paying 50 guineas a year. John Baghot de la Bere retired from Prestbury in 1860 and moved to Bristol where he died in 1885. John, Kinard's older brother became vicar, at Prestbury, and moved in and extended the rectory and had also restored the Church by 1868. John was a very popular with his parishioners but not with the archbishops. He was part of the Oxford Movement which wanted the church to return to a catholic form of service focusing on the altar and the communion service. The Archbishop of Canterbury held an enquiry, (1881 – 1883), and an order of nisi of prohibition was taken depriving John of his living. John moved out of the rectory and lived in Burbage for a short time before moving to the south coast where he died in 1909. He was highly respected by the congregation who erected a plaque in his memory at Prestbury. Despite John’s displeasure with the bishops his son John became Vicar of Prestbury, 1919 – 1944, taking care of St Marys in a quieter fashion than his disruptive father. Whilst his brother was preparing for a life in the church, Kinard left Marlborough and studied Civil Engineering under Brunel. Brunel worked on the the Marlborough Downs Railway shortly before he died in 1859 so perhaps the young Kinard was employed on this project. He later superintended large engineering works with expenditures of £250,000. Work took him to South America with Osborn Edwards, (perhaps a relative). It was whilst working in Southern Ireland he married Catherine Mary Leaby of County Cork, where he lived for over ten years. The couple had three sons and three daughters whilst living in Pimlico, London, Glamorgan and latterly Leicestershire. The youngest son Stephen was born in December 1877. The census returns for Burbage list his birthplace as both Burbage and Wales. He became an artist of some repute. Educated at Ilkley College before studying art in London and Paris. His works featured in many leading galleries in Paris, Madrid and Venice including the Royal Academy. He Illustrated various books – Don Quixote, Gulliver’s travels and worked on leading magazines and periodicals up to the 1920's. Stephen's pictures are much different from his book illustrations. They are very detailed works in watercolour with pen and ink, often mythological subjects which can command thousands of pounds as they rarely come on the market. During WW1 he served in France as a 2nd Lieutenant. He died at his Fathers home in Bath aged 50 on 29th July 1927. By 1867 Kinard had retired from engineering and took up agricultural pursuits becoming an authority on rural economy especially poultry keeping. Stable economy or how to keep a horse on £10 a year. Pigs for profit - His book on rural economy passed through 200 editions. His fame reached Parliament and he was often consulted on agricultural matters. It was whilst living in Burbage he discovered that sodium metasilicate, commonly known as water or icing glass, a jelly like substance stopped egg shells from becoming porous preserving them for up to nine months. In his twenty four years in the village he served the community as Chair of the Board of Guardians and for many years an active member of the Burbage Debating Society, where in 1887 he argued for a clean water supply which was not delivered until 1915. The De la Bere's left Burbage in 1904 and are next found on the 1911 census at Bishop Stortford. Here they lived with unmarried daughter Sybil and eldest son Lancelot who owned a chemical business, perhaps he manufactured icing glass? At the age of 80 Kinard and his wife Catherine moved to 52 Sydney Buildings, a fine Georgian house in Bath where they lived until his death at the age of 94 in 1932. 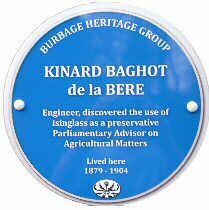 As his name suggests Kinard Baghot de la Bere was quite a ‘colourful’ character often changing his name and accounts of his life, profession, interests and homes but throughout his long life his most creative and productive time was during his 23 years in Burbage. De La Bere Crescent, Burbage is named in his honour.